Lionel Sanders is coated in sweat. It’s a hot morning in early August, and he has set up his bike in the backyard of his modest bungalow in Windsor, Ont. He’s been riding the bicycle – a lime-green carbon road bike connected to a stationary CompuTrainer machine – for about an hour and he has nearly two more hours to go. Wearing only spandex shorts and bike shoes, Sanders, 27, has placed his training station in direct sunlight to maximize his discomfort. When he takes off his sweat-soaked headband and wrings it out, the liquid it releases onto the hot pavement could fill a small glass in one squeeze. For Sanders, a professional Ironman triathlete, this exercise in masochism is just the beginning of his daily routine. If anyone has the right to offer pithy inspirational quotes, it’s Lionel Sanders. Six years ago, he says, he was struggling with drug addiction after dropping out of university. Today, he’s the youngest guy and the only Canadian ranked among the top 10 Ironman triathletes in the world. On Oct. 10, Sanders is headed to the birthplace of the Ironman, Kailua-Kona, Hawaii, to compete in the sport’s hallowed world championship. One of the strongest cyclists and runners in the field, he has a legitimate shot at the podium. The course has never been completed in less than eight hours. It’s the kind of thing athletes spend years training for, and it requires them to push themselves to the limits of what their bodies can endure. Sanders grew up in a one-stoplight town called Harrow, about 45 minutes south of Windsor. With a population of about 2,700 – and shrinking – everyone in Harrow knows everyone else, and there isn’t much for kids to do. Sanders excelled at running as a teen and was the captain of the Harrow Hawks cross-country and basketball teams at Harrow District High School. He showed a natural talent for athletics, but as a teenager, he just wasn’t that interested. A former teammate, Josh Huffman, said he and Sanders ran because they felt they had to. Sanders may have slacked off in practice, but through sheer force of will, he still achieved impressive results. More than running, it seemed he enjoyed winning. “The guy is just so headstrong. He’d run through a wall,” Huffman said. Sanders says he preferred to spend his free time partying. He started smoking marijuana when he was in Grade 8, he says, and did it progressively more throughout high school. By the time he went to the University of Windsor, Sanders says he was smoking pot daily. He didn’t make the cut for the cross-country team and it wasn’t long before he says he graduated to cocaine and developed an escalating dependency. He describes how, after his second year at Windsor, he dropped out and stopped running. Things deteriorated after that. He started taking freelance ghostwriting work he found online, and with only $200 monthly rent, he says he did the “bare minimum” he needed to get money for drugs and alcohol. When he didn’t have the money for coke, Sanders says he sniffed glue and gas, popped pills – sometimes not even knowing what he was taking – and in his “darkest days,” he tried boiling down NyQuil pills. Sanders says he is still in touch with some of his friends who knew him during that time, but they “want nothing to do with any media.” Attempts by The Globe to reach people who may have been with him at the time of his drug use were unsuccessful. Huffman, Sanders’s former high school teammate, came to Windsor the year after Sanders enrolled, and he, too, tried out for cross-country. He heard stories from older team members who had known Sanders the year before. “They would tell me about running into him downtown, and he was high as a kite,” he said. Sanders’s parents described the difficulty of watching their son struggle and four other people contacted by The Globe described a period of several years where Sanders seemed to disappear. Doug Sanders said his son’s struggles “really hit home” when he came home for a visit in 2008. They spend about an hour in the pool and after each length Sanders swims, MacDonald gives him feedback on his form. With almost every criticism, Sanders pushes back. “I can’t think about so many things at once,” he protests, visibly frustrated. 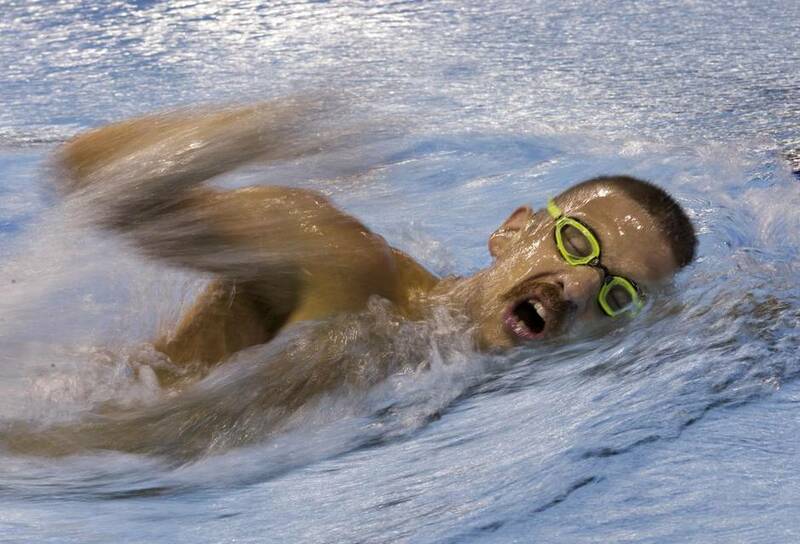 “He’s hard to coach,” MacDonald laughs as he swims away for another length. “I’ve already fired him a few times,” she adds, only half joking. Swimming is Sanders’s weakest area, so improving his technique is a top priority. He has had great success winning half-Ironman races, but his record on full Ironmans is less impressive. Of the four full-Ironman races he has completed, Sanders has won only one, Ironman Florida, last November – and the swim portion of the race was cancelled because of unsafe water conditions. Sanders’s training routine is intense even by Ironman standards. While most triathletes might train for five to seven days, then take a day or two of rest, Sanders will stretch his training blocks to as many as 18 days in a row. Even on “easy” days, he’ll still train for about three hours. He does a lot of his training in a small room he’s dubbed the “pain cave.” He often tweets photos showing the temperature inside set as high as 32 C, with 80-per-cent humidity, to mimic the Hawaiian climate. He’s been known to keep a bucket next to the treadmill so he doesn’t have to stop for bathroom breaks, says Barrie Shepley, Sanders’s mentor and occasional coach. Following all-day training sessions, Sanders recovers by replacing calories quickly. But for all the training in the world, a race can come down to luck. At his most recent Ironman, on Aug. 16 in Mont-Tremblant, Que., Sanders placed fifth after suffering two leaky tires and a jammed bike chain. His biggest challenge at Kona, however, likely won’t be his swimming, or even luck. It might be his age. At 27, he’s as much as 10 years younger than some of his competitors. Triathletes tend to peak older than in other sports, in their mid-to-late 30s. As athletes age, their muscles go through more and more capillarization – the formation of new blood vessels – because of a lifetime of exercise, Shepley said. Over time, this allows the muscles to bring in more blood and take away more lactic acid, which increases endurance and allows athletes to go harder for longer without needing to stop. So while younger athletes may have more power, allowing them to excel in sprinting, older athletes tend to have the muscular endurance necessary for long-distance endurance racing. “There’s nobody who’s done well in Hawaii [in] his youth,” Shepley says. Experience helps, too. In the four Ironman races Sanders has completed, he’s learned valuable lessons each time – about proper hydration, or simply the mental fortitude necessary to carry on after getting a flat tire. Perhaps to mitigate his relative inexperience, Sanders is focusing his mental energy on his biggest threat: German triathlete Jan Frodeno. Frodeno, 34, is ranked first in the world and all three times he and Sanders have crossed paths, Frodeno has finished ahead. Sanders went to Kona last year as a spectator and rode his bike behind Frodeno for part of the marathon, to observe him and spot weaknesses. “I was able to hear his breathing. See how he suffers,” he says. At their last meeting at a half-Ironman race in Oceanside, Calif., this spring, Frodeno finished in first place, just more than three minutes ahead of Sanders. The loss haunts him, Sanders says: The background image on his computer is a photo of him running side-by-side with Frodeno that day. He keeps the computer in the pain cave, so he can see the screen when he’s training. “I literally stare at it every day,” he says. Running ultimately helped Sanders recover from addiction, he says. After many failed attempts to quit drugs, on Nov. 5, 2009, only a couple days sober, Sanders says he laced up his shoes and went for his first jog in years. He kept it up every day. Before long, despite the fact that he was nowhere near ready, Sanders signed up for his first Ironman, to have something to work toward. The race was to be in August, 2010, in Louisville, Ky. But in March, 2010, after three months of being sober, Sanders relapsed. This wasn’t like the other times he had failed to stay clean. The night after his relapse, overcome with shame, he says he nearly took his own life, but couldn’t bring himself to go through with it. On the old Ford Test Track in Windsor, Ont., girlfriend Erin MacDonald sets Sanders’s pace for a 32-kilometre run. Sanders moved in with his dad a few days later, determined to have no more false starts. He spent the rest of the summer training for the Ironman. Race day came and he completed the course in 10 hours, 14 minutes, 31 seconds – a remarkably fast time for someone who had quit using drugs mere months earlier. By 2013, he was winning triathlons over established pros, and he turned pro himself in 2014. Sanders’s early success raised some eyebrows in the relatively small Ironman community. He seemed to explode onto the scene out of nowhere and for some skeptics, his history and his rise from addict to pro in only a few years has prompted speculation that he might be doping. After all, skeptics say, he has a history of drug abuse. In an interview with The Globe, Starykowicz said his comments had been misinterpreted to mean he was equating Sanders’ former drug use with doping, or that this supposed inability to feel pain offered Sanders some unfair advantage. “I never accused him of doping or anything like that,” he said. Starykowicz also pointed out that TRS Radio is a satirical podcast and his comments shouldn’t be taken too seriously. “The whole system is botched, and it totally needs to be revamped,” Starykowicz said. Sanders said there’s no incentive to dope in Ironman, because the money is too little, compared to other sports. If he were doping, he said, it would make more sense for him to be a pro cyclist. “Cycling would be more lucrative for me, but [there’s] so much drugs and crap in cycling – I have no interest,” he says. Today, Sanders is done talking about his past. All that was years ago, he says, and he’s not that person any more. He’d rather not talk about it at all, but he takes solace in the fact that he might be able to help others. “My 100-per-cent motivation is to inspire people and give them hope that they don’t have to live like that,” he says. There aren’t many people who can push themselves the way he feels he must. “The same reason why I was good at doing drugs, it’s the same reason why I’m good at doing Ironman,” he says. For most of his adult life, he has been single-mindedly focused on one thing – it’s just that the goal has changed. It’s 6:25 p.m., at the end of this long training day, and Sanders and MacDonald have just arrived at the Ford Test Track in Windsor, a massive, 1.6-km paved track that was once used to test Ford vehicles. Sanders has already spent about four hours training, not including time for travel, changing and meals in between. As Sanders heads off to run a warmup lap, MacDonald unloads a bike from the car. She’s going to ride alongside him, setting the pace for his 32-km run. In the distance, the Detroit skyline is visible over the top of the trees that line the track. There are still a few hours of early August daylight left, which is good, because Sanders will need about two hours to finish. Sanders circles around after his first lap, and MacDonald catches up to him. “Ready?” he asks.